On Wednesday, November 28, a special meeting was conducted by the Elk Grove City Council. The purpose of that meeting was to discuss the newest mobile communication technology, the so-called 5G. During the meeting, the city council heard extensive commentary from the public about how the new technology will be implemented in Elk Grove. Major mobile communication providers like AT&T and Verizon are angling to have the ability to place their antennas and other facilitating equipment anywhere in the city without input from the public. Among the major concerns raised by several speakers are the adverse health effects from the radio waves produced by existing technologies and the possibility the 5G could exasperate those effects, especially when placed in residential neighborhoods or near schools. Other concerns expressed include aesthetics, and if the city grants the telecommunication companies their wishes, the inability of the public to have a say where the equipment is placed. Other speakers who presented information at the meeting where telecommunication company representatives, and City of Elk Grove senior staff members. 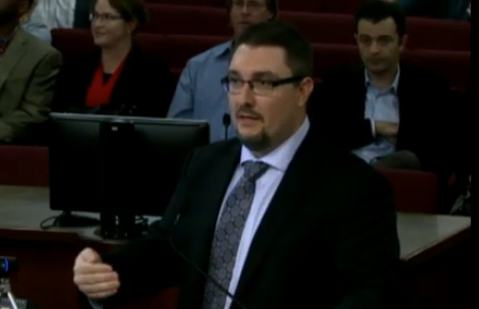 Among those presenting on behalf of Elk Grove was the city's Innovation Czar, Christopher "CJ" Jordan." Jordan, who earlier this year was promoted by interim city manager Jason Behrmann to head the city's nascent Innovations Department, discussed how the new technology could help his department address two of the community's persistent problems - traffic and the lack of economic development achievements. Although Jordan did not implicitly endorse the telecommunication companies request to place their equipment wherever they desired, he did acknowledge it has advantages over the current fiber and copper wire-based technology in use by the city. The Elk Grove City Council will decide at a later date whether or not to grant the requests by the telecoms. Below are some of the comments made during Jordan's presentation.